March 10, 2006: It's official: Solar minimum has arrived. Sunspots have all but vanished. Solar flares are nonexistent. The sun is utterly quiet. That was a solar maximum. The Space Age was just beginning: Sputnik was launched in Oct. 1957 and Explorer 1 (the first US satellite) in Jan. 1958. 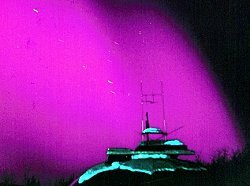 In 1958 you couldn't tell that a solar storm was underway by looking at the bars on your cell phone; cell phones didn't exist. Even so, people knew something big was happening when Northern Lights were sighted three times in Mexico. A similar maximum now would be noticed by its effect on cell phones, GPS, weather satellites and many other modern technologies. Dikpati's prediction is unprecedented. In nearly-two centuries since the 11-year sunspot cycle was discovered, scientists have struggled to predict the size of future maxima—and failed. Solar maxima can be intense, as in 1958, or barely detectable, as in 1805, obeying no obvious pattern. We have something similar here on Earth—the Great Ocean Conveyor Belt, popularized in the sci-fi movie The Day After Tomorrow. 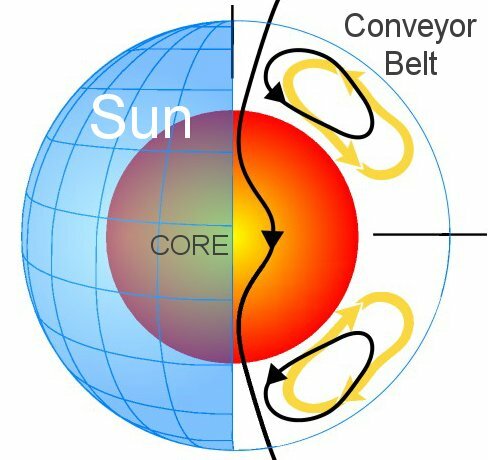 It is a network of currents that carry water and heat from ocean to ocean--see the diagram below. In the movie, the Conveyor Belt stopped and threw the world's weather into chaos. "History shows that big sunspot cycles 'ramp up' faster than small ones," he says. "I expect to see the first sunspots of the next cycle appear in late 2006 or 2007—and Solar Max to be underway by 2010 or 2011." Solar Minimum Has Arrived -- (Science@NASA) In 2006, the sunspot cycle has hit bottom. Scientists Issue Unprecedented Forecast of Next Sunspot Cycle -- NCAR press release. Scientists Gaze Inside Sun, Predict Strength of the Next Solar Cycle -- NASA press release.